North Devon is an area renown for its wild, natural beauty; it includes the towns of Bideford and Barnstaple, Ilfracombe and Lynton and Exmoor National Park. The area can be reached via the A39 from the east or the A361, the North Devon link road which spurs off from the M5 at junction 27. Bideford and Barnstaple are covered here for other resorts see links on the left. Bideford is a small town and port lying on the River Torridge which flows to the sea at Appledore, two miles downstream. Bideford of the past was a thriving port which traded in agricultural goods and china clay. It is now more of a tourist resort but still has some activity at the port. The main quay is the focus of the town with small twisting streets running up from this area in to the town. Bideford has two picturesque bridges - the one from the past is built of stone with arches that are all different widths and links the main town to East-the-Water, the new bridge is constructed of concrete and spans the River Torridge downstream and carries the A39 the main linking road for North Devon. At the mouth of the River Torridge, where it meets the River Taw, lies Appledore which is a quaint fishing village and anchorage. Surprisingly there is also a large shipyard here which has been in continuous production for around 400 years producing small naval and merchant vessels. 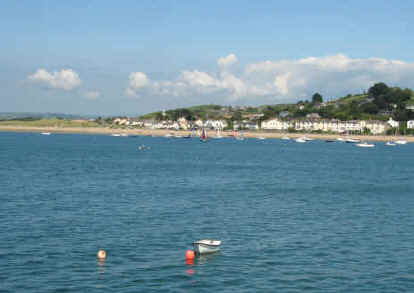 The estuary area is popular for watersports but care is needed regarding the tide which is very strong at times. There is a good slipway and car park for trailers at the far end of the village. There are excellent beaches at nearby Westward Ho! which is a holiday resort with several caravan parks and plenty of affordable accommodation. The beach is 3 miles long and very wide at low tide - it is also flat and sandy with a large pebble ridge at the back of it which protects the nearby burrows area. There are a lot of watersports in the area with surfing on the main beach and further along the coast. Barnstaple is a market town set on the banks of the River Taw which meets the River Torridge downstream. Barnstaple is the administrative centre for the area and is an attractive town in its own right. 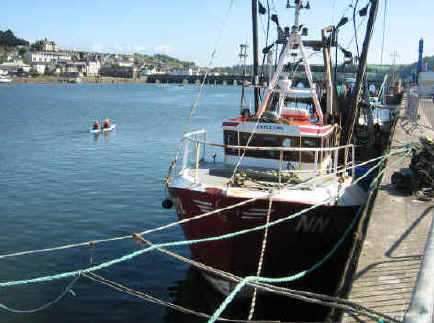 Barnstaple is an ideal place to visit the surrounding area which has much to offer in the form of natural attractions. The beach area at Braunton Burrows is even larger than at Westward Ho and is sandy, wide and flat. Part of the area is a designated nature reserve. the beach is good for swimming and surfing although you need to check the local information as to which part of this huge beach to use. Exmoor National Park is an unusual area in that it is part upland moor and part rugged cliff tops. The park straddles the Devon-Somerset boarder and offers a great deal to the visitor. The coastal section is mostly cliff tops which rise up to 366 metres with breathtaking views of the Bristol Channel. Inland there are gentle hills and many valleys the most famous of these areas being the Doone valley, the setting for the novel Lorna Doone, by R D Blackmore. The land rises steeply to form a plateau at Dunkery Beacon which is at a height of 520 meters. Within the wooded valleys can be seen Exmoor ponies, red deer and horned sheep while above you may see buzzards and kites. It looks even better when the sun shines! Westward Ho! - Great beach and amusements, cafes, pubs and accommodation. Lundy Island - Catch MS Oldenberg from the quay.